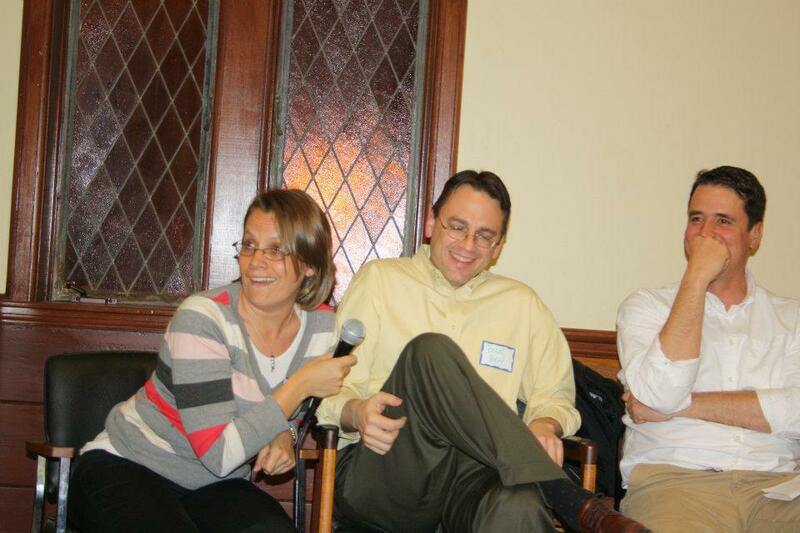 This episode was recorded as part of the January 2012 Mormon Stories regional conference held in Houston, Texas dedicated to the topic of “Maintaining Positive Relationships Through Empathy and Dialogue.” Panel participants include Heather Olson-Beal, Brent Beal, Jacob Brown, and John Dehlin. Amazing! Thanks to all the panelists for being so open and honest in sharing your feelings and experiences. I felt hopeul that children can be raised in a healthy, nurturing, and open way after a faith crisis. My husband has decided that he will not be a part of the church ast this time. I completely understand and respect his decision. I have chosen to remain somewhat active (dislike the label of active/less-active, but I plan do my calling and at least attend primary with my children) while I process and continue in my own journey. I do have a quesion that was touched on….but hoping for some further thoughts and insight. How do you handle the extended family’s influence on your children. I come from a very rigid, orthodox, letter of the law livin, and law lovin family. I am sure that they will consider it their righteous”duty” to warn my kids about the sinful path that “satan has lead” their dad down. My husband is absolutely one of the kindest, most empathetic and compassionate people I know. This choice was made as a matter of integrity. He could no longer support an institution that can be oppressive and cruel toward those we associate with and call our friends. I don’t know if there needs to be ‘ground rules’ or how to navigate this. My older kids have personal e-mail accounts and correspond regularly with extended family. Thinking about this is heartbreaking….I know there will be no understanding or compassion…only judgements and scriptures verse suggestions. We are pretty open and honest with our kids, but worry about the influence of other family. Help! What has worked for you? Excellent podcast! The suggestion that each spouse know enough about the other’s position to explain it to the children was interesting, but probably not helpful or practical for most folks. My spouse has refused to read what I’ve read and has told me on several occasions that she just doesn’t understand where I’m coming from. As a former believer, I can certainly explain her POV to the children, but I wouldn’t expect her to be able to explain mine. As a middle aged Latter-day Saint raised by an LDS mother and a Roman Catholic father, I have to tell you I do not believe that mixed faith marriages are the best way to raise children. My parents tried hard to be respectful of each other’s beliefs, so respectful that the children were taught next to nothing about Jesus or God or the Bible in order not to unduly influence my siblings and I one way or the other. I chose the LDS faith as a teenager, on my own, and pursued my own religious quest for knowledge and belief. I have watched my siblings and particularly their children pursue no religious course and end up not even knowing what Christianity believes in general terms. My nieces and nephews could not even tell you what Christians believe about Easter or who Christ was! I simply do not believe this works on a practical level. My parents were of different faiths — Mom was Catholic and Dad was Congregationalist — and it worked out fine. They reached out to one another. Mom joined Eastern Star because Dad was active in Masonry, even though involvement in Masonry was unusual for Catholics at that time. Dad helped teach me the Catholic catechism, played golf with our parish priests, and sometimes went to the convent and took all the sisters out for dinner. They focused on the things that their faiths had in common, and on being examples of kindness and virtue. This is a fabulous podcast. I appreciate so much all who shared their experiences and thoughts about talking to our children. I feel more empowered to share my new understandings and beliefs with my children and am so grateful for everyone’s insight! Thank you, thank you. Very interesting. Why does it cut out right at the baptism story? Is there a way to hear the rest of it? It cuts out right where her father is talking to her after church and before the baptism, not too far from the end of the tape. Thanks.